The more I read how the successful authors do it, the more I realize that, like successful people in all walks of life, they all do things in common that contribute enormously to their success. So how can we learn from successful authors to ensure our own success in 2018 and beyond? 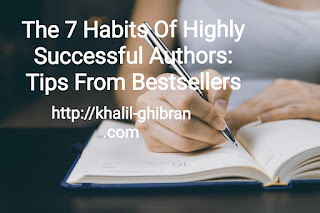 We can start by adopting what I call “The 7 Habits of Highly Successful Authors”. Adopt these 7 habits and you just may find that 2018 is the year you break through your own writing barriers! 1. Write about something you care about. Whether you are writing fiction or non fiction, it is imperative you write about something you care about. The successful authors have some emotional connection to their content or story. If you are writing fiction, then write from a place of emotional familiarity. Your genuine experience will come through in your writing and your readers will connect with that. If you are writing a non fiction piece, choose a topic you are passionate or enthusiastic about. After all, if you are going to invest your precious time in what you are writing, you owe it to yourself to write with passion, feeling and enthusiasm. Don’t be afraid to put your head, or your hands, on the chopping block when you write. In the world of fiction, you will have no doubt heard about creating characters that are “larger than life”. That doesn’t mean they are giants, it means they go above and beyond and take risks and make decisions that we would not have the courage to take in our own lives. After all, it’s not about what we would do when we are tethered by the restrictions of polite behavior, it’s what we would do in our wildest imaginations that make our readers sit up and take notice. For the non fiction writer, it’s time for you to take a stand. Take a view and stick with it, presenting your case with conviction and vigor. No one listens to someone who writes meekly, or with a wishy washy hand. Stick your neck out, and don’t be afraid to get it chopped off. All the greatest journalists are the ones who are not afraid to speak their minds. Get into that habit and you’re well on your way to being that next great journalist. This is definitely the most ignored but equally the most important phase of the writing process. Planning is essential to the success of any undertaking and writing is no different. J.K. Rowling spent 5 years planning the entire Harry Potter series before she put pen to paper on a single word that appeared in the books. If you are writing a short story, novel or screenplay, planning the story before you begin writing is as essential to your success as ink in your pen or power to your laptop. There are some writers who claim to just start with an image or a sentence and then the whole thing just unfolds before them, but the writers who can do this with any degree of success are few and far between. Take the time to plan out your story, at the very least know where your beginning, middle and end are. The more planning you do, the more enjoyable the writing process and the less rewriting and editing you will have to do. The same goes for non fiction pieces, where it’s always advisable to have an outline in place before you write your article or book. Joyce Carol Oates said that she would write, even when her soul felt as thin as a playing card, because somehow the act of writing would set it aright. There are going to be times when you just “don’t feel like it”, but like any other job or activity that is important to you, you must still, somehow, sit down every day and write. It has been said that it is by sitting down every day to write that one becomes a writer. Stephen King writes every day, including Christmas Day. Whether you are working on a book, story, article or nothing, still sit down and write something every single day. Even if you only write one page every day, that’s 365 pages in a year and that’s a whole book, isn’t it? When you are a writer, you cannot not write, and writing is like breathing. You have an urge to put things down in print, so to keep that fresh and alive, you need to turn that tap on every day. It’s more than practice. It’s life. I read somewhere once that John Grisham worked for 4 hours per day and made $20 million per year. Whether that is true or not (about the hours worked or the money he makes) doesn’t matter. It is far more common to hear tales today of the world’s most popular commercial authors working their proverbial butts off to keep up with deadlines, promotional commitments and the ins and outs of their everyday lives. Janet Evanovich gets up and writes every morning at 5am so she can get a full day’s writing in before she has to answer mail, emails and deal with her other affairs of business, Jodi Picoult has a wonderful stay-at-home husband who allows her the luxury of writing through school pick ups and travelling for long periods to do research for her novels. J.K. Rowling also said she (misguidedly) thought that life as an author would be a Jane Austen-type of affair, sitting in a room overlooking a field and writing in anonymity. Of course her life is a whirlwind of book launches, movie premieres, media commitments, school commitments, and of course she has a family with three children. And while we all no doubt wish we had her “problems” it is very obvious that in the early part of the 21st century, the life of an author, successful or not, is a hard-working life. We are either working hard to get noticed, working hard to stay noticed, or working hard to avoid being noticed. Any way you look at it, if you have an aversion to hard work, you need to look elsewhere. Successful authors work hard. Period. It is said that persistence outstrips all other virtues. I have a card propped up on my desk that says, “Success seems to be largely a matter of hanging on after others have let go”. Almost every successful author I have studied has said that their success is due, at least in some part, to pure persistence and determination. If your manuscript or article is rejected, rewrite it and submit it again. Or submit it to someone else. The first Harry Potter novel was rejected by every major publishing house before Bloomsbury picked it up for a song. Even so called “overnight successes” have a story behind them about how many times they were rejected, or how many novels or articles they’ve written that have no value other than as fire kindling. The authors that succeed are the ones who don’t stop until they do. It’s that simple. Never give up. Winners never quit, and quitters never win. And finally when you have written your article, book or screenplay and have submitted it for publication or approval, let it go. If you’ve done the best you can with it, let it go and trust that it will make its way to where it needs to be. And start something else straight away. Regardless of whether what you have submitted is accepted or rejected, you are a writer and a writer writes. Once you finish one manuscript start immediately on another. If the one you’ve sent is picked up, they’ll be happy that you’ve got something new already, and if not you’re well on your way to finishing your next manuscript. So those are the 7 Habits of Highly Successful Authors. Adopt these habits yourself, and before you know it, you too will join their ranks!